I’ve been noticing an interesting trend over the past year, which is that the more Paleo my diet has gotten, the more I seem to relish watching the Food Network. I suspect that it’s some sort of compensatory mechanism–I love baking, but Paleo, at least by my reckoning, offers few opportunities. I think watching Paula Deen make horrifyingly gooey, fudgey, caramel-drenched brownie concoctions actually gets it out of my system a bit. This morning was sipping my coffee and switched on the Food channel, where I caught the last few minutes of Hungry Girl. Or, rather, I mostly ignored the last few minutes of Hungry Girl. (Honestly, what is her deal? One minute she’s trying to get the fat out of salad dressing and the next she’s making cookies with Splenda, and 5 minutes after that she’s making whole-wheat pasta…) So anyway, the point is that I was reading a book and only half listening when she started talking about making kabocha squash fries. I should have started paying attention at that point, but instead I started Googling to figure out their nutritional profile. I learned that kabocha’s are high in beta carotene, vitamin C, as well as B1 and B2, and are lower in carbs than butternut squash. Super. What I did not learn is how to properly prepare a kabocha. Undaunted by this small detail, I hit Sprouts this morning before the gym and procured the squash, among other things. My usual routine after the gym is to preheat the oven, do whatever prep work I need for dinner, or in this case, lunch, and then take a shower. It was probably good that I still had my running clothes on, because cutting and peeling the squash turned out to be a serious upper body workout. I couldn’t find any particularly helpful advice online about prepping kabocha, so I improvised as best I could. I started by slicing the squash in half vertically and removing the seeds. I then quartered it, and halved the quarters. I tried peeling them at this point, but found that the curvature made the process difficult and inefficient. Since I planned to cut the fries with a crinkle cutter, I needed the pieces to be as flat as possible anyway. I ended up basically cutting the eighth wedges into thirds, peeling them, and then cutting them into fries. 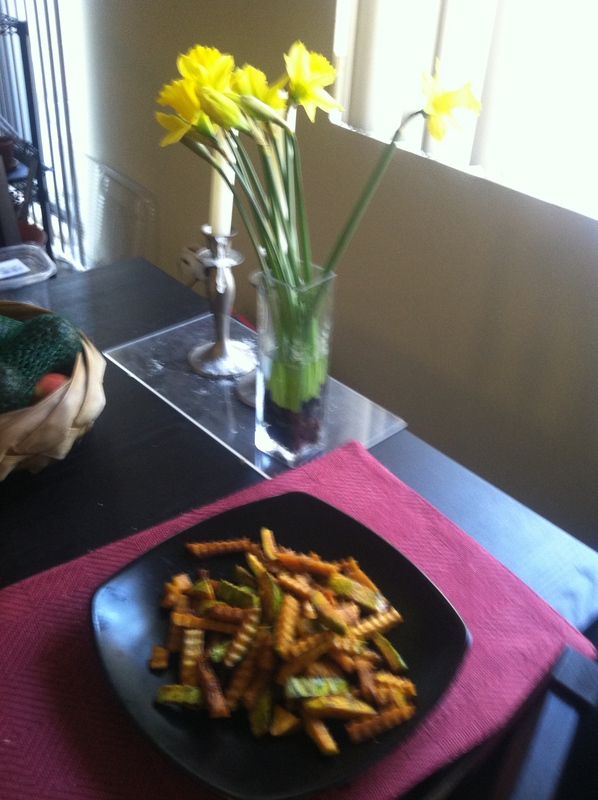 After much crinkle-cutting, I prepped the fries in batches. 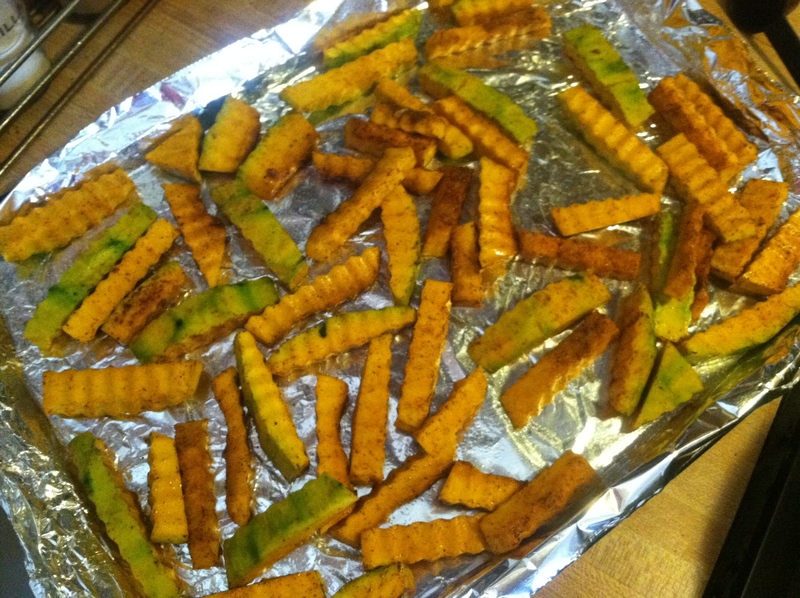 The only time I’d had kabocha before was in a Japanese preparation, so I decided to go with my usual seasonings for butternut squash for this first foray into fries. 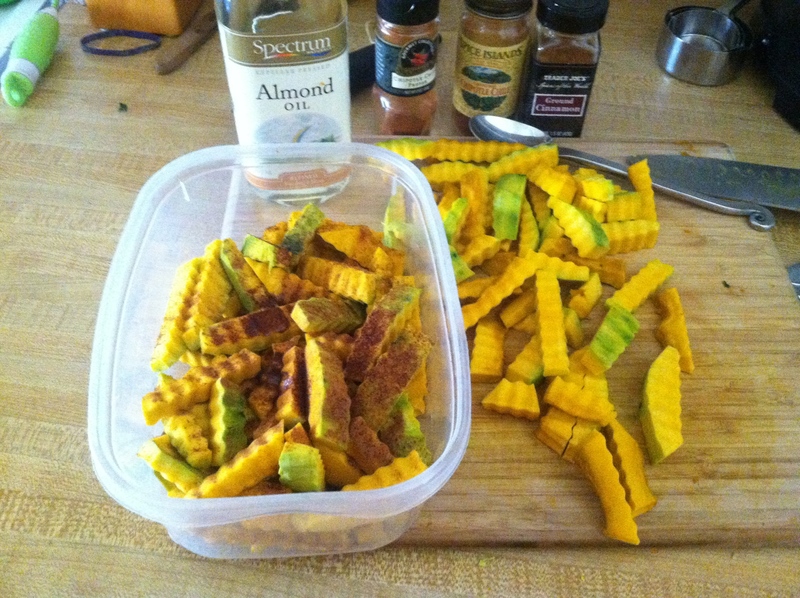 I tossed the squash with almond oil, cinnamon, chipotle and ancho chile powder, and salt. I then popped them in the oven and hit the shower. When I got out I started in on cleaning up the mess in the kitchen, which is where our cautionary tale starts. I had peeled the squash into the sink, and I was careful to rinse the peels down the disposal in small batches with plenty of water. Nothing seemed amiss until I started washing my knives and cutting board, and noticed that the water didn’t seem to be draining. I flipped the disposal on again, and heard the reassuring hum, but the water did not get sucked down; instead, it turned a rather ominous shade of brown and a few squash seeds floated up in the churning water. After exhausting all my usual tricks–manually cranking the disposal until it clears, snaking, and trying any reasonable suggestion on Google, I was frustrated, but not ready to give up. Finally, after an hour of plunging, with strategic opening and closing of the sink vent and the drain on the other side, I finally got the clog cleared. I never actually thought I would be grateful for being forced to acquire the knowledge of a journeyman plumber to pass my architecture licensing exam last year, but it actually came in handy. All’s well that ends well, I suppose, but please, save yourself the hassle and DON”T PUT THE PEEL DOWN THE DRAIN. Anyway, between cutting up the kabocha and all the plunging and scouring of the sink that followed, I feel like I logged an extra upper-body session today. The fries were delicious, and (minus the plumbing issues), worth the work. This was also the first time I tried the crinkle-cutter, and I think it was worth the investment. The nagging problem I usually have with squash or sweet potato fries is that they tend to stick and burn against the pan, even when they’re not otherwise overdone. Adding texture to the fries really helped the sticking problem, and while I’m generally against kitchen gadgets that only do one thing, I’m happy to make room for this one. 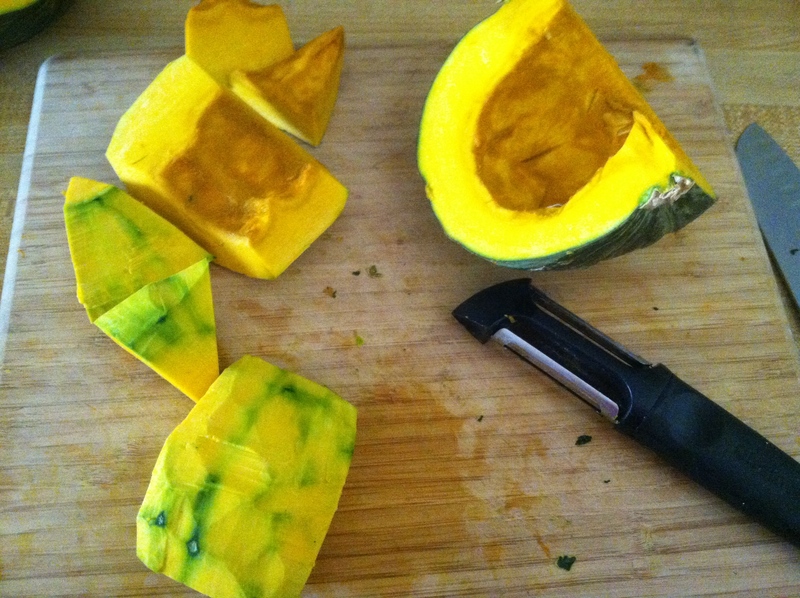 Using a long, sharp knife, halve the squash vertically, then cut halves into quarters. Halve the quarters again, and cut the wedges into thirds. 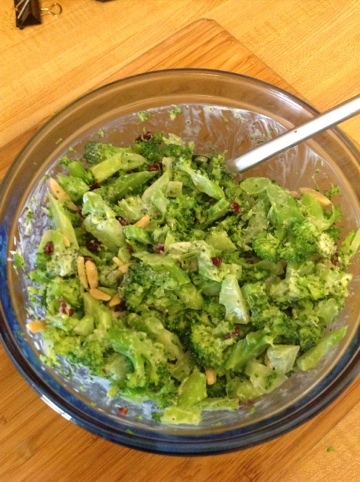 (You’ll have two triangular-shaped pieces and one rectangular from each section.) Peel using a vegetable peeler. Spread the fries out in a single layer on oiled baking sheets. Bake for 20-25 minutes, giving them a shake halfway through. Serve immediately. The difference between Try and Triumph is the Umph. Runner’s World has been staunchly pushing high-carb diets for runners for years. I was pleasantly surprised to find this in my RW email tonight. 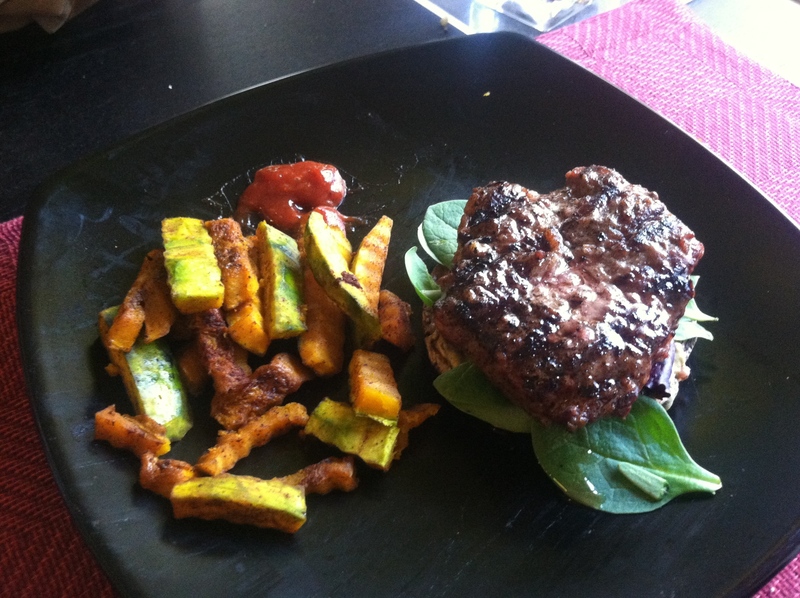 Last week I got curious about the GAPS diet, as it kept popping up on a lot of Paleo blogs. After doing some reading I concluded that, while I can give up many things from my diet, alcohol and dark chocolate are not among them. Still, I liked some of the ideas behind GAPS. It got me interested in probiotics, which was an aspect of Paleo that I had never really explored. Undeniably, cultured foods were a staple in the human diet until very recently. Fermentation provided a means to preserve the harvest, prevent spoilage, and in some cases, provided an enjoyable side effects. Aside from these obvious advantages, fermented foods were also providing more subtle improvements to human health. In Probiotic Foods for Good Health, Beatrice Trum Hunter details a wide range of studies showing that the addition of yogurt to the diet can improve not only digestive function, but also boost immune response (without promoting inflammation), reduce incidence of rotovirus and rhinovirus infections, and lessen the effects of both food sensitivities and nasal allergies. The presence of lactic acid in the diet also appears to inhibit cholesterol production in the liver. The bacteria responsible for lacto-fermentation help to break down proteins and sugars in the gut, making nutrients more bio-available. The mechanisms behind this process are fascinating, though I’ll leave it to those with a biology background that runs deeper than 7.013. 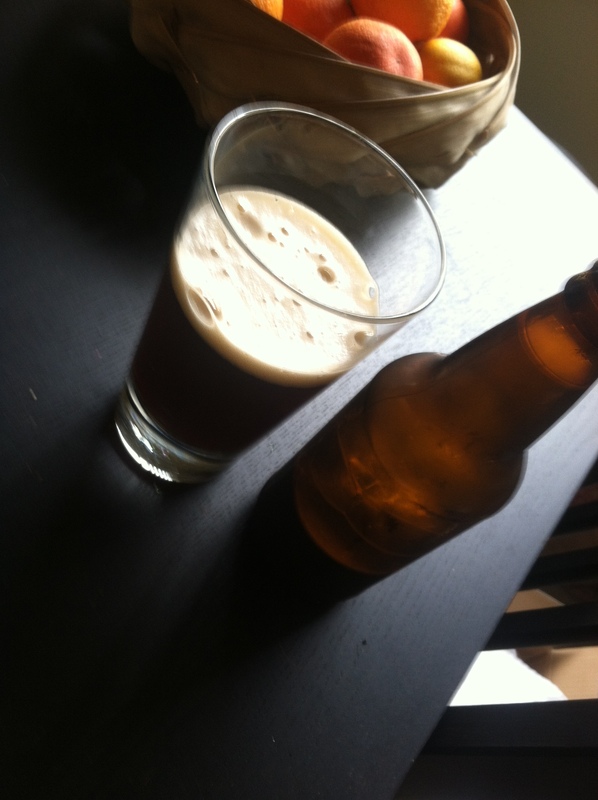 I’ve actually been making my own yogurt for years, and, while not strictly Paleo, I’ve also dabbled in home brewing for a while too. Outside of these, though my only real experience with making fermented foods was my dad’s experiment with sauerkraut one summer, of which I was not a fan. As a friend one said to me, “I love the idea of homemade sauerkraut, but I’m not sure I could eat anything made by someone willing to ferment cabbage in their home.” Still, I was intrigued enough to try some DIY, and after some blog surfing, I came across this recipe for cultured strawberry applesauce. I de-stemmed, cored, pureed, and waited. When I opened the jar after about 36 hours, it smelled vaguely like sourdough, which seemed like a good sign. I’m notoriously paranoid about food safety, though, and I was a little concerned that the wrong bacteria might have multiplied and be lurking to kill me. I tried a teaspoon, which was delicious–applesauce with lovely strawberry overtones and a delightfully sour note. After another 8 hours and no obvious adverse affects, I tried a tablespoon. The next day I ramped it up to a quarter cup, after which I decided it was safe. I also decided that I needed to read something that assessed the safety of what I was doing, so as not to drive myself crazy. I ordered Wild Fermentation and started reading. Putting the long history of fermented foods in context helped assuage my worries, and the multitude of recipes in the book had me hooked. I decided that kimchi would be the next project, and today I got it underway. I have no idea how spicy this first batch will turn out, but I’m of the general opinion that kimchi can never be too hot. I assembled one head of Napa cabbage, a nice chunk of ginger, some radishes, a carrot, one jalapeno, four serranos, and two habenero peppers. The cabbage got a rough chop and went in a pot to soak in some brine with the sliced carrot and radish for a few hours. I then made the remaining peppers and ginger into a paste in the food processor. After the cabbage and friends were done soaking I poured off the brine, reserving it, and combined it with the spice mixture. I then jammed all of it into a jar and topped it off with the brine. 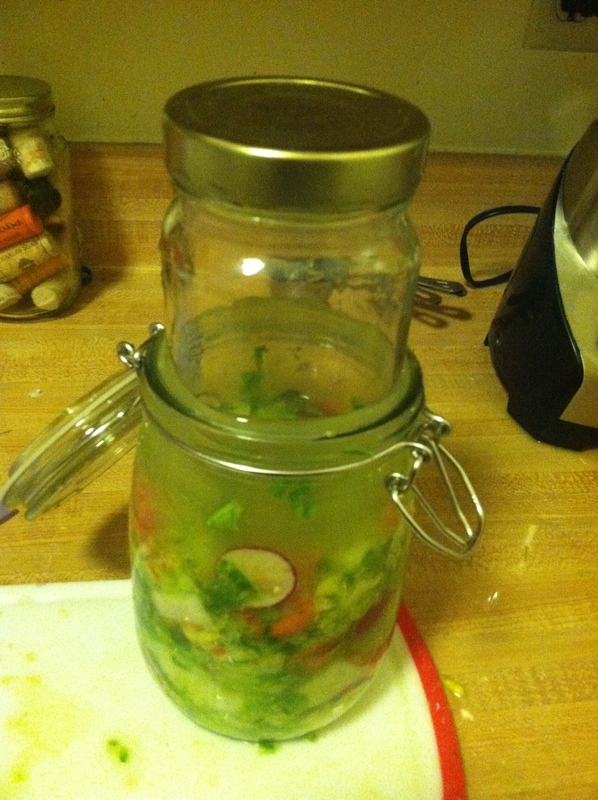 I used another jar to weigh everything down and keep the veggies submerged in the brine. I covered the whole thing with some cheesecloth to keep the dust off and tucked it into a dark corner of the kitchen. 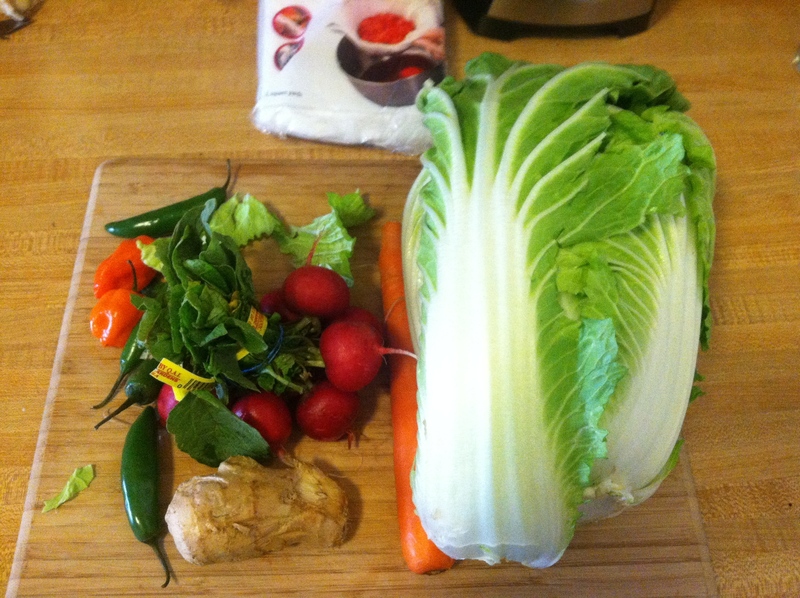 If all goes well, in a week or so, I should have some kickin’ kimchi, and I’ve got big plans for it… Stay tuned.